The health benefits of olives have been appreciated for over 7000 years in the Mediterranean region, where they have been cultivated by Egyptians, Greeks and Romans. Today they remain of major agricultural importance in the Mediterranean basin and a key ingredient in the renowned Med Diet. Nowadays they are also cultivated in other parts of the world. The fruit of the olive tree (Olea Europea) are an excellent source of healthy olive oil. Although olives are not commonly juiced, I’m including them under the “Healing Food” section due to its many healing virtues by mainly its oil – which is essentially olive juice. 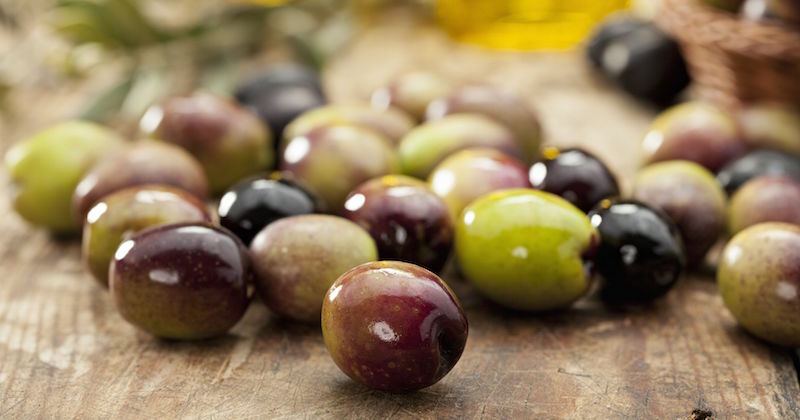 Many varieties of olives are used to produce olive oil, but here we will focus on the varieties that can be eaten raw (or less frequently cooked), either green or ripe. The olive fruit is botanically a drupe, green in color when young, and blackish-purple when fully ripe. It is composed of three parts: a thin, smooth peel or epidermis, a pulpy flesh of varied texture (from soft to firm), and a hard woody stone in the center. The fruit pulp is rich in lipids, which tends to increase in concentration as the olive ripens. In general terms, edible olives can be classified in two main types: 1) green olives, which are harvested before they are fully ripe, have a firm flesh and are green in color; 2) black olives, which are harvested when they are fully ripe, have a softer flesh than green olives, and are black or purple in color. They are rich in fatty acids, especially oleic acid, an omega-9 monounsaturated fatty acid. Olives soaked in natural salt – brine also contain the essential minerals found in natural salts. Olives are packed with vitamins such as beta-carotene, vitamin E, D and K.
They also contain anti-oxidants (polyphenols), phytonutrients , flavonoids, and fiber. Thanks to their high content in monounsaturated fats and high anti-oxidant content, olives are a very health food. Anti-cholesterol action: Both monounsaturated fats and polyphenols found in olives help prevent oxidation of cholesterol, and hence have a remarkable protective and preventive effect against atherosclerosis and related cardiovascular diseases, such as stroke and heart attack. 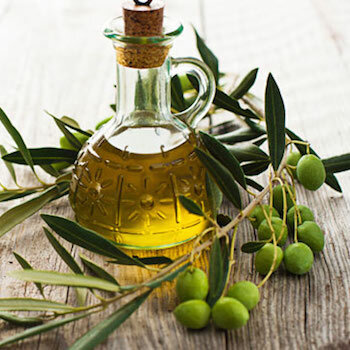 Antioxidant and anticancer activities: Polyphenols, vitamin E and beta-carotene are the most important anti-oxidant substances found in olives. The anti-oxidant activity of polyphenols is particularly significant: through their action against free radicals, they help prevent cancer, premature aging, heart disease as well as many other types of degenerative and chronic conditions. Bone health: Olives are rich in vitamin D, calcium and phosphorous, which all play a critical role in bone growth, remodeling and maintenance and help prevent bone conditions such as rickets in children and osteoporosis in adults. Heart health: In addition to their anti-cholesterol action, polyphenols exert a beneficial effect on the cardiovascular system by also preventing blood clots formation and promoting vasodilation. This results in decreased heart work and improved heart function. 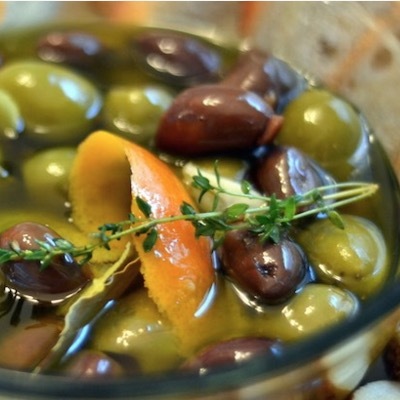 Purifying effect: Olives improve both the liver and the intestinal functions. Thanks to their high fiber content, help cleanse the colon and ease/prevent constipation. All these effects result in improved detoxification and excretion of toxins from the body, with consequent improved function and health of the whole body. Restorative properties: Due to their high content in minerals, olives are excellent natural alternatives to multi-mineral supplements used to give the body more energy, strength and nutrients. Skin health: It is well known that anti-oxidants have a beneficial effect on skin health, since they help prevent the damage caused by free radicals on skin tissue. However, olives also contain relatively high amounts of beta-carotene, the precursor of vitamin A, and vitamin E which play an important role in stimulating skin regeneration and providing skin protection. Therefore the combined effect can help maintain a healthy, smooth and young skin. Vision: Vitamin A is not only beneficial for skin health, but is also essential for eye health and normal vision—especially in low light. Edible olives can be used in a variety of dishes. They can be eaten raw, in salads, or they can be used to prepare sauces for pasta or to garnish meat or fish dishes. Olives can be even eaten roasted or stuffed and fried. Olive paté (a paste made from crushed olives) is enjoyed in Italy on crusty bread with raw veggies. Olive oils come in many different qualities. Look for extra virgin olive oil, that is preferably cold-pressed. Raw olives are very bitter so are usually soaked in a concentrated brine solution, making it a very salty food. People with high blood pressure may want to avoid taking olives preserved this way. Look for olives soaked in brine made from natural salts such as sun dried sea salt or rock salt.